On Thursday's World News on ABC, substitute anchor David Muir brought up the Gallup Daily Tracking Poll numbers from Monday which at that time showed President Obama with a 47 percent approval rating and a 45 percent disapproval rating. But, since Monday, the tracking poll numbers have turned further against Obama each day, with today's poll showing that the President's approval rating is back down to 41 percent with his disapproval up to 50 percent. As Muir referred to the Gallup survey as "one poll," he did not inform viewers that this same poll had trended away from Obama since Monday. However, in spite of showing the outdated more positive number for Obama, neither Muir nor correspondent Jake Tapper gave the poll a particularly positive spin for Obama as Tapper noted that the President would still have a difficult time getting reelected with an approval rating below 50 percent. After Muir displayed the Monday survey result on screen, noting that the President's approval rating was "inching up ever so slightly in one poll," he went on to caution, "but we gather the White House isn't celebrating this number." Tapper asserted that "the numbers are going in the right direction," but went on to warn that President Obama would still likely have a difficult reelection. Tuesday's NBC Nightly News had hyped the Monday numbers as an improvement for Obama while noting - but downplaying - the less favorable Tuesday numbers. DAVID MUIR: Jake, you see the Romney team encouraged by their numbers. President Obama's approval rating inching up ever so slightly in one poll - 47 percent approval, the highest since July - but we gather the White House isn't celebrating this number. JAKE TAPPER: No, the numbers are going in the right direction, David, and that's key in polling: Where are the numbers going? 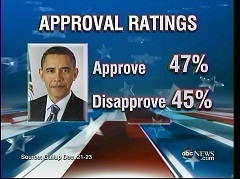 But still, President Obama is under 50 percent approval rating. It's very tough to get reelected when your approval rating is under 50 percent. In fact, the only way to do so is to make your opponent so outlandishly unacceptable, there's no choice that voters have but to pull the lever for you. That's what George W. Bush did to John Kerry in 2004, and that's what Barack Obama is probably gonna have to try to do to whoever the Republican nominee is in 2012, David.